Every Monday and Thursday evening at 7pm there is an introduction to Buddhist meditation, held in the London Diamond Way Buddhist Centre. Before the evening starts, we usually have a cup of tea in the lounge, and then go through to the meditation hall. A Diamond Way teacher will give a short introductory talk about a Buddhist topic, and take any questions that people might have. Then they will guide the meditation. This Buddhist meditation class is suitable for beginners who have no experience of meditation, because it’s guided, and everything is explained. The meditation on the 16th Karmapa that we use is also suitable for experienced practitioners. You don’t need to book for the meditation class – just turn up. Doors open 7pm; we start at 7:30 sharp. You don’t need any preparation for the class. Meditation cushions are provided; do let us know if you will need a chair instead. 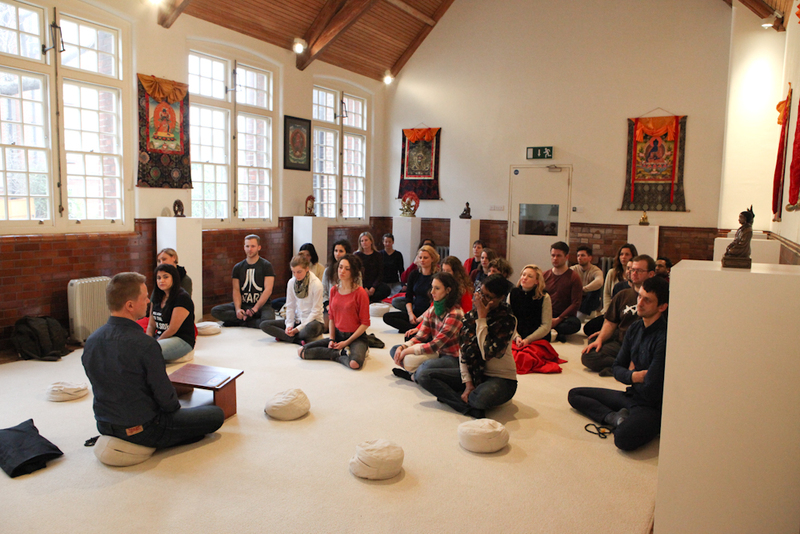 The Introduction to Buddhist Meditation evenings are free of charge. The Buddhist centre is a charity, and you are welcome to leave a donation. If you like these evenings and decide that you want to take your meditation practice further and to support the centre, you can speak to someone in the centre about becoming a member. The London Diamond Way Buddhist Centre is in Zone 1. For instructions on how to get here, see the page How to find the Buddhist centre.